Looking for some of the best cookie recipes on the web? We have scoured pinterest and some of our very favorite blogs to make your interest search much easier! From sprinkles to chocolate, sugar cookies and more, we love to find our favorites and share with you! 1) Spaceships and Laser Beams has officially stolen my heart with these mouth-watering Caramel Apple Pie Christmas Cookies. 2) Snowflake butter cookies with jam filling make a beautiful gift and also a delicious treat for our kids. They love the butter cookie with jam surprise center. 3) Make some holiday sugar cookie brittle for the crunch factor kids love, without the teeth breaking strength of a traditional brittle. Plus, it has M&M’s in it. 4) These dipped gingerbread men cookies will definitely be a hit with the kids. They can decorate them with buttons and clothes for the true gingerbread man experience. 5) These mint-filled star shaped homemade Oreos are a mouthful to say, but are so worth it. Introduce your kids to the deliciousness of mint and chocolate. 1) Fudge Kiss Cookies are a spin on the classic, and I think all kids would like these because chocolate on chocolate! 2) These chocolate peppermint kisses cookies will be made for the kids, but we all know it will be us parents to snack on them until they’re all gone. 3) Make some peanut butter blossom cookies to satisfy the very strong, and very real, peanut butter and chocolate craving all kids seem to have this time of year. 4) If you’re looking to impress everyone (not just the kids!) then these Nutella Christmas Cookies are the way to go. 5) This festive cookie recipe calls for Hershey’s bells, but I think they’re close enough to kisses if that is all you have on hand. Check out Peppermint Bark Bell Cookies that will not disappoint your sweet tooth. 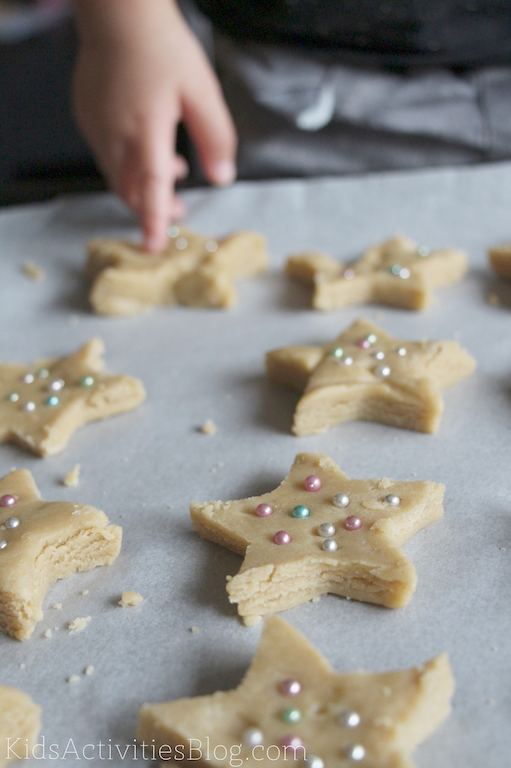 1) These Christmas Star Cookies from Kids Activities Blog are such a classic cookie and a must have this year. 2) Ok, Ok…this one may not be a cookie in the truest sense of the word, but these sprinkle sticks are kid, on the go friendly, and gift friendly. 3) What better time than Christmas to enjoy some reindeer poop…cookies. I guarantee you, just the thought of reindeer poop will sent your kids into a laughing fit. 4) Make cookie time educational with these Tangram Christmas cookies. 5) For another kid friendly craft, let your kids make their very own Sugar cookie pops or feel free to check the perfect sugar cookie recipe here. 1) Fudgy Chocolate Peanut Butter Chip Cookies are just the thing you need for your kids who have a hankering for chocolate AND peanut butter. 2) You can’t go wrong with a classic chocolate chip cookie recipe or a red velvet cookie recipe – well tested and a family favorite! 3) White chocolate chip cookies are a non-traditional, but highly loved variety of -chip cookies. There is a certain charm that only white chocolate chips can have. 4) Make some Chocolate chip angel cookies and tie them into a lesson on being a good person or why we have Angels. 5) For your older children these Biscoff Spread Chocolate Chip cookies will be a knock out this year. photo courtesy of Crystal and Co.
1) Adorable Snowman Christmas Cookies from Crystal and Co. will be the hit of any classroom holiday party, and kids will love helping you decorate these. 2) Bring Santa’s reindeer to life with this Gingerbread cookie reindeer garland from Kitchen Counter Chronicle. 3) Skip the baking all together and go straight to decorating with adorable Santa Nutter Butter cookies. This is the perfect decorating task for preschool aged children. 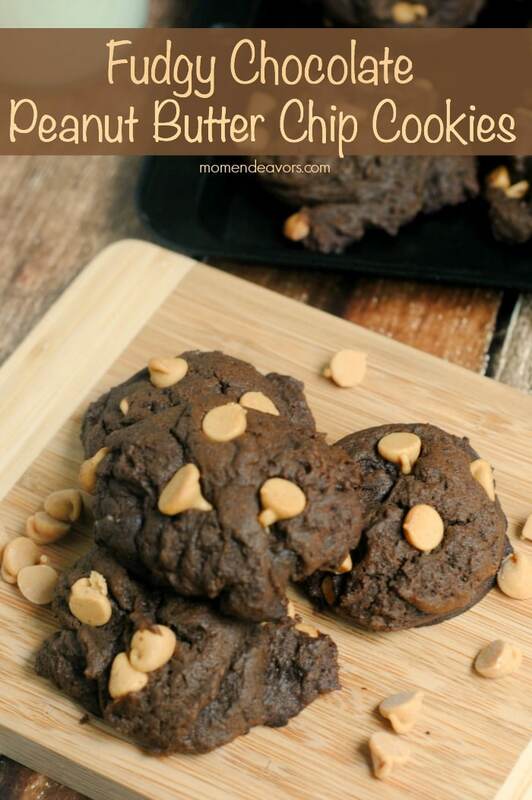 And it may not be a nutter butter, but check out these easy Reeses Peanut Butter Cookies! 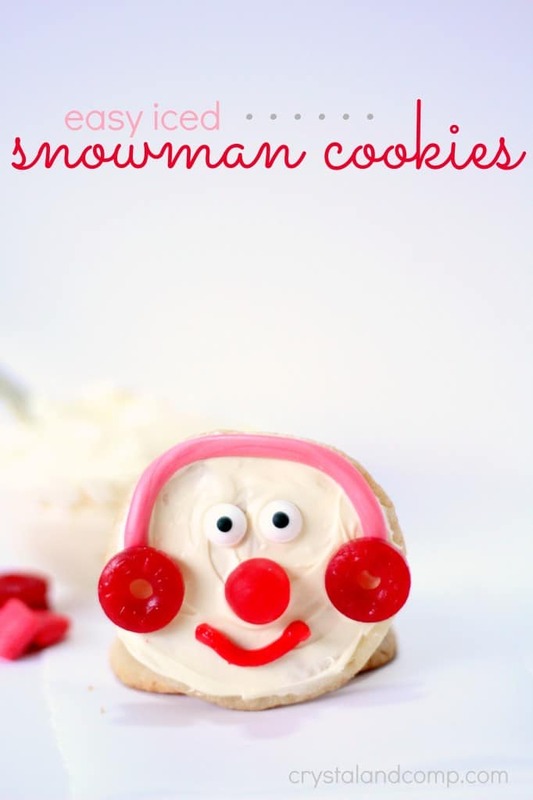 4) Bring a laugh into your home with adorable and heart-touching melting snowman sugar cookies. Your children will get a kick out of eating a half-melted snowman. You can also try our Sugar Cookie Puzzle. 5) Make Christmas tree cookies on a stick for a truly kid-friendly cookie. It might just help eliminate some of those crumbs that seem to pile up this time of year. Before go, while its not a Christmas recipe, our top cookie recipe on MomDot is our Viral Firecracker Cookie recipe. Think sugar cookies…with a POP!